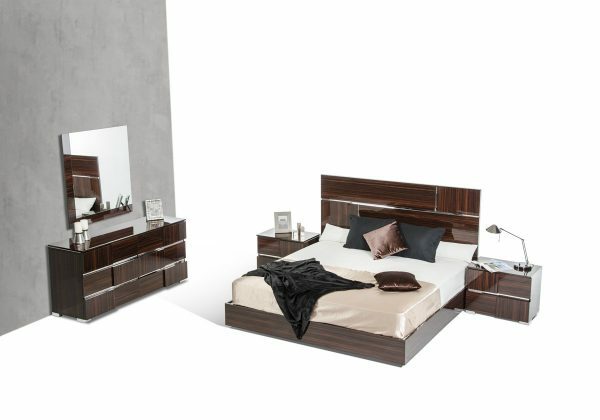 Made in Italy, the Picasso bedroom set is stunning due to its original Italian design and unique finish. The Picasso is finished in a marvelous ebony lacquer which is accentuated by shiny chrome acrylic accents. Matching chrome accents highlight the headboard and drawers for a sharp look. 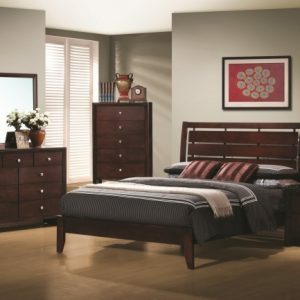 The two drawer nightstands and six drawer dresser provide abundant storage for your clothing. Another popular feature includes a solid melamine wood platform which takes the place of standard slats and creates a sturdier base for the mattress. Available in Queen and Eastern King sizes. Also available in elm grey finish. Five drawer chest is sold separately.